Warm half the oil in a large frying pan. Chop the leeks, garlic and onion. Add them to the pan, season and fry gently for 5-7 minutes, stirring now and then, until softened. Chop the parsley, then mix with the breadcrumbs, zest and some seasoning in a bowl. Gently warm the stock. In a frying pan, heat the rest of the oil and fry the crumb mix for 2 minutes, stirring, or until golden. Tip onto kitchen paper. Add the rice to the frying pan, stir for 1 minute, then add the wine and cook for 2-3 minutes until reduced. Slowly add the hot stock a ladleful at a time, stirring between each addition and only adding more when the liquid has been incorporated. This takes about 20 minutes. Taste the rice to check it’s cooked with a little bite, then season with salt and pepper. Spoon into warm bowls, top with the crumbs, squeeze over lemon juice and serve. Our friends at Majestic Wine recommend Definition Gruner Veltliner. This Grüner Veltliner is a livewire of white peach and white pepper spice. 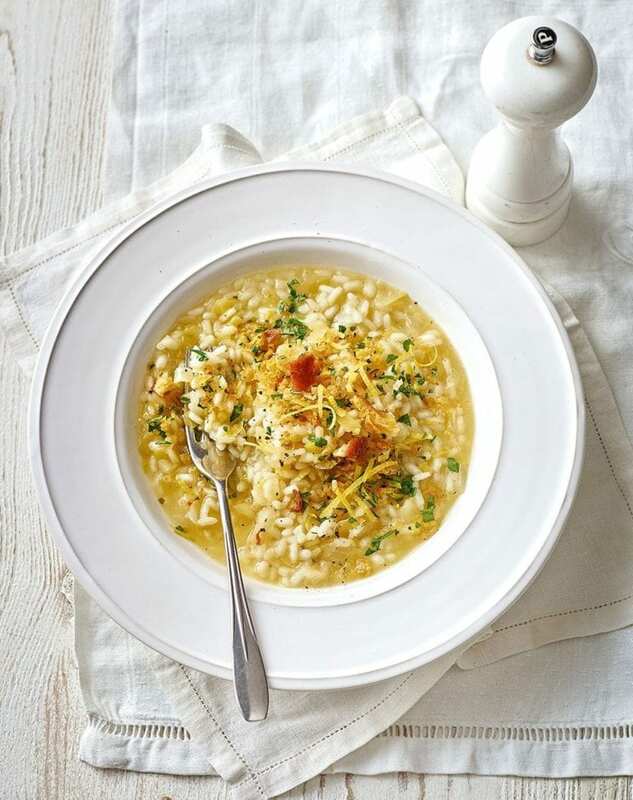 Its mouthwatering acidity is the perfect foil for this creamy risotto.